On Thursday, July 26, the ROM and OCAD U presented their joint web-based project Uncover/Recover. 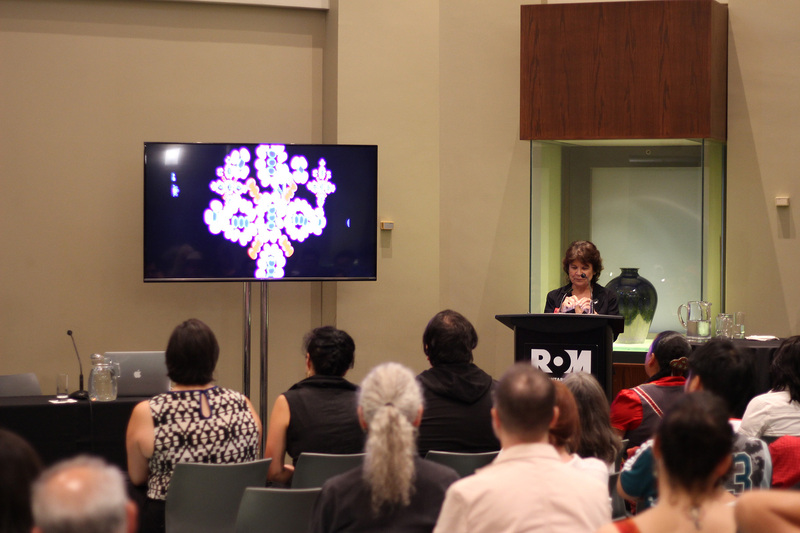 This collaboration began last year, when students in the Indigenous Visual Culture program (INVC), led by Professor Bonnie Devine, received an opportunity to interact with, and respond to, Indigenous artifacts from the ROM’s archives. The project was designed to promote dialogue and exchange between the objects, Indigenous peoples and the Museum. Eight students each chose an artifact and interpreted the object using video, animation, beading, material arts, music and sound, among other media. The result will be interactive and viewable via a website accessible across the province. Thanks to funding from the Government of Ontario, the university was able to hire graduate and undergraduate research assistants from the Digital Futures program to work on this course: Wendy Whaley, Bernie Leroux, Samuel Strong and Samaa Ahmed. Elisha Lim (MFA, CCP 2017) is the project manager. This project illustrates how the INVC program can interface with Digital Futures to create something new and exciting, and it deepened OCAD U’s important relationship with the ROM. Explore the extraordinary designs of Dutch couturier Iris van Herpen's 2008-2015 collections that push the boundaries of traditional fashion and craftsmanship. Her looks have graced red carpets and have been worn by Lady Gaga, Beyoncé and more. This installation merges chemistry, artificial intelligence and encompassing soundscapes from Philip Beesley and his collaborators to create a visually stunning, interactive and immersive environment. Spiders: Fear and Fascination, June 16, 2018 - January 6, 2019. Learn about these ingenious predators who use one of nature’s most versatile materials – spider silk. See the vibrant yellow robe woven from the silk of 1.2 million golden orb spiders. 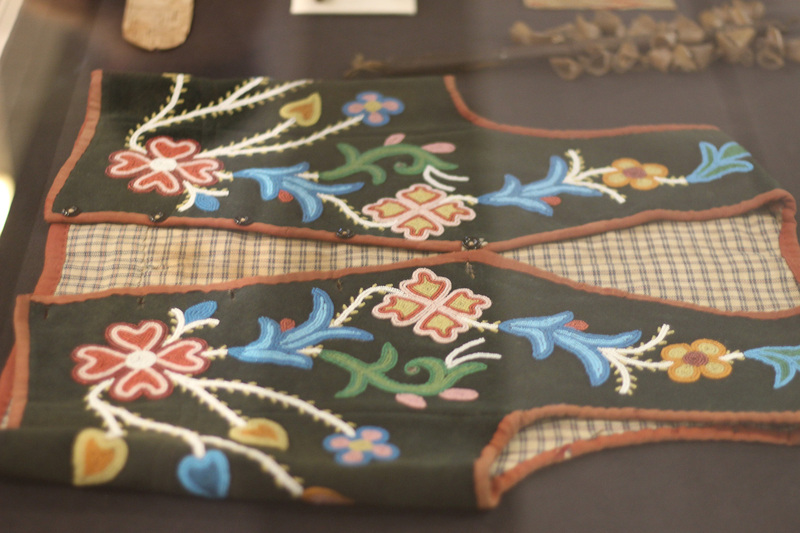 A museum technician in white gloves laid out a beaded vest and an ornate hood at the media preview of Uncover/Recover at the Royal Ontario Museum April 6. Imbued with history, culture and artistry, these colourful artifacts are among the objects from the ROM’s archives that nine students from the INVC program are researching for an interactive digital project. The result, Uncover/Recover, will be an online learning environment that incorporates photography, sound, digital manipulation and time-based media. At the preview, students Megan Feheley and Shawn Johnston spoke about how they developed their works, what inspired them and the travel and research they undertook for this deeply personal project. Feheley will transform and animate images derived from beadwork, while Johnston’s audio work will incorporate the sounds of a deer hoof rattle. Bonnie Devine, associate professor and the founding chair of the INVC program, believes the project will bring the stories of these artifacts to viewers across the province, and country. The Uncover/Recover website will be online this summer thanks to funding support from the Ministry of Indigenous Relations and Reconciliation. OCAD University is pleased to announce an innovative collaboration with the Royal Ontario Museum (ROM) to showcase Indigenous culture and history before and beyond Ontario’s 150th anniversary. 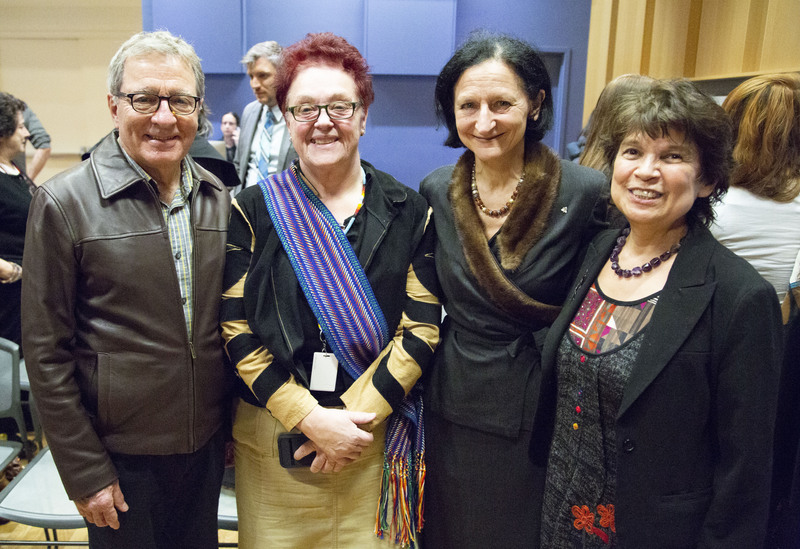 Ontario’s Ministry of Indigenous Relations and Reconciliation is investing $200,000 in the project. 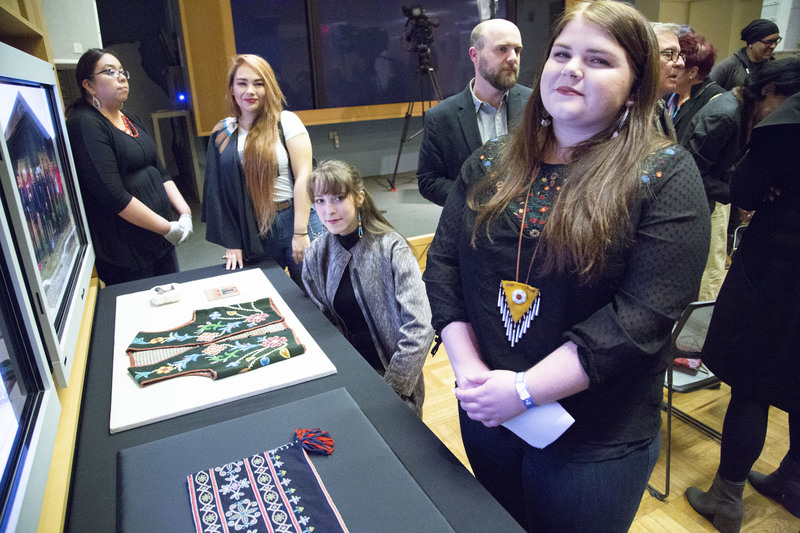 Students from OCAD U’s Indigenous Visual Culture program will explore relevant cultural objects at the ROM and use digital and other media to share them with a larger audience. The project will include the creation of an interactive online learning environment that will incorporate gaming, commentary and the exchange of local stories through social media. OCAD University was one of the first art and design institutions in Canada to launch a degree in Indigenous Visual Culture. 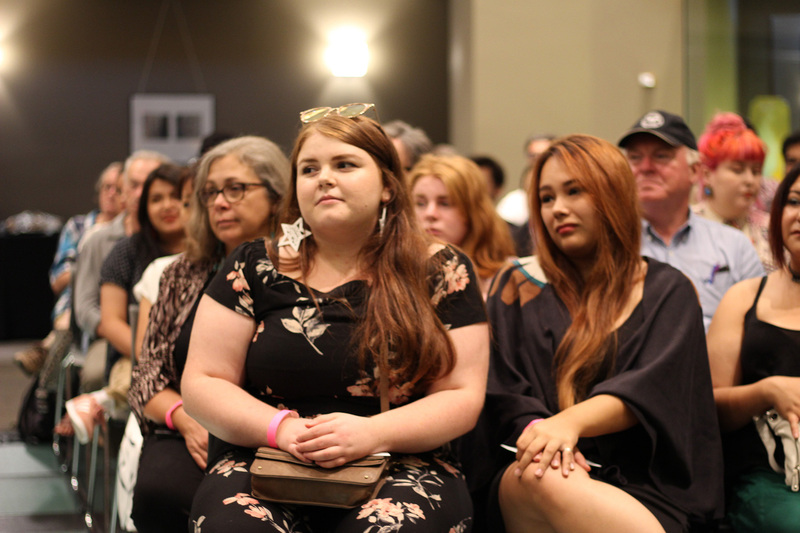 The university works in tandem with its Aboriginal Education Council, Indigenous Student Association, and with all faculty and staff across the university to support the process to decolonize the institution and to recognize, acknowledge, implement and vitalize Indigenous visual culture. In collaboration with the Royal Ontario Museum and Images Festival, OCAD University Graduate Studies presents a public screening of "Isaac Julien: Rethinking Space". Isaac Julien is a multi-award winning British artist and filmmaker based in London. Many of his films, including the two screened, are immersive multi-screen experiences that reflect on the past and project the future, touching on themes of identity, diaspora, memory, and representation. With support from Isaac Julien's studio, this event will feature two short films, Baltimore (2003) and Fantôme Afrique (2005), followed by a panel discussion. Current BA (Honours) in Visual and Critical Studies student Maya Wilson-Sanchez's text "Collaboration, Family and Photography: The Process of Creating an Installation for the Family Camera Exhibition" is featured on the ROM's blog. Maya gives an overview of the Family Camera project through her participation in the Digital Futures Graduate Program course “Special Topic: Family Camera at the ROM.” The Sesquicentennial Exhibition The Family Camera will launch at the ROM in May 2017. The Exhibition will examine ideas surrounding the contemporary Canadian family through vernacular photography and the changing definitions of family, experiences of migration, memory and mementos. "The Family Camera" project asks the questions: What are family photographs? How do they shape our memories? How do they mediate our experiences of migration? What can they tell us about our national histories? The Family Camera opens May 6 at the Royal Ontario Museum, 100 Queen’s Park. Join us once a month for a personal exploration of the exhibit Worn: Shaping Black Feminine Identity and its themes. Special guest speakers give us their take on this stunning work by Karin Jones in an informal in-gallery presentation. Dalton Higgins is a National Magazine Award-winning journalist, broadcaster and author who has written six books that interweave the worlds of digital culture, hip hop and popular culture into one potent mix. He is also one of Canada’s foremost experts on hip hop, the leading youth sub-culture of this generation. Mimi Joh currently teaches in OCAD University’s Continuing Studies program and writes on contemporary art. She received degrees in Art History from Cornell University and OCAD U, and worked for many years with German and Austrian Expressionist art in New York. Mimi Joh is an active volunteer in the arts, holding positions with multiple Toronto based arts organizations. Her varied art background gives her a multiplicity of viewpoints into contemporary art, ideas and themes. She is particularly interested in how art practices can critically reflect and respond to our society and how they ultimately shape our culture. Jessica Karuhanga is an artist currently based in Toronto, Canada. Her practice undulates between performance, video, drawing and sculptural processes. She holds a BFA Honors from The University of Western Ontario and a MFA from University of Victoria. Her visual art and performances have been presented at various centres nationally including Royal BC Museum, Deluge Contemporary Art, Art Mûr, Whippersnapper Gallery, OCAD U Student Gallery, Videofag, Electric Eclectics, Nia Centre for the Arts, and The Drake Hotel. Karuhanga was featured in FADO Performance Art Centre's 2014 Emerging Artist Series at Xpace Cultural Centre. She has lectured for the Power Plant's Sunday Scene Series and Art Gallery of Ontario's Idea Bar Series. Most recently she presented her work at 2015 Black Portraitures Conference, a series organized by Tisch School of the Arts at NYU, in Firenze, Italy.